Black and white theme with easy theme extending option. All default Joomla pages with custom styles. Below, we'll go into more details on most of key features with accompanying screenshots. 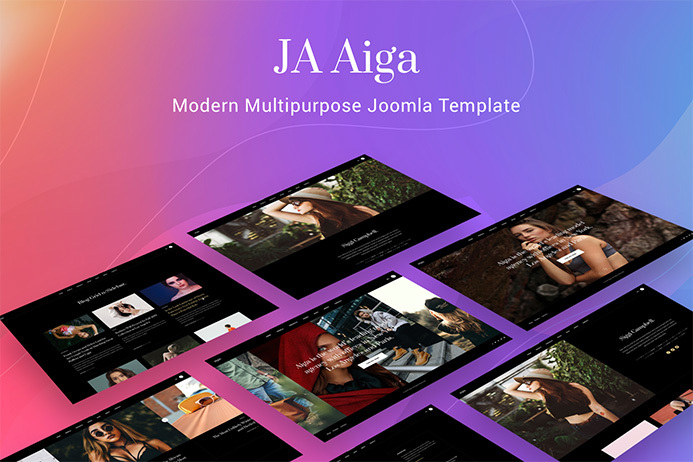 JA Aiga multipurpose Joomla template has been ideally designed for fashion and modeling agencies, portfolio, blog or magazine websites. However, the diversified layout options keep the versatility aspect to remarkable levels with notable Blog layout options to be easily adaptable for Journalism or personal portfolio or photography sites also. 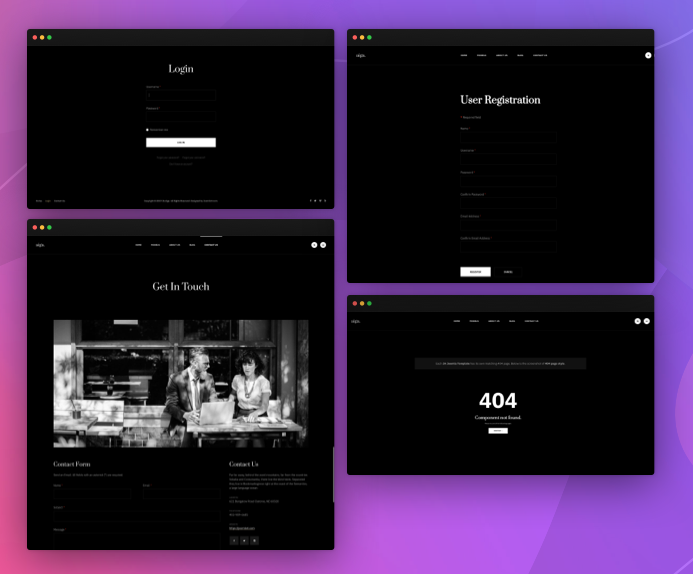 All template pages based on powerful bootstrap 3 responsive grid system, are fully responsive and adaptive with the layouts and elements to adjust for all kind of screen sizes. Responsiveness can make your site a rewarding site for Google search engine as Google had already started using mobile friendliness as a imperative ranking signal. The multipurpose Joomla template comes with 9 different Homepage variations to choose from. Home Split 2 col and more..
Wishing to view all homepage layouts in action, You can glance through the demo site homepage to see the layout options which are readily available in JA Aiga with quick redirects to every layout. 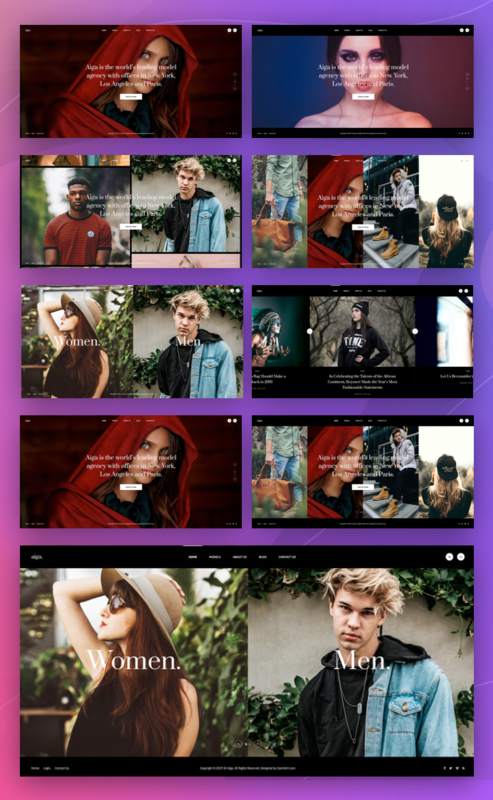 If you’re a model looking for creating an online version of your lookbook or a modeling agency that wants to reach new clients, then your best bet is to look for a portfolio style theme whose main focus are images with some notable layout options such as “Model Detail Split” “Model Detail Cover” or “Model Detail Centered” to choose from.. The multipurpose template comes with varied “Model pages” option to with primary objective to try to transform the visit into a sensory and memorable experience for the viewer. 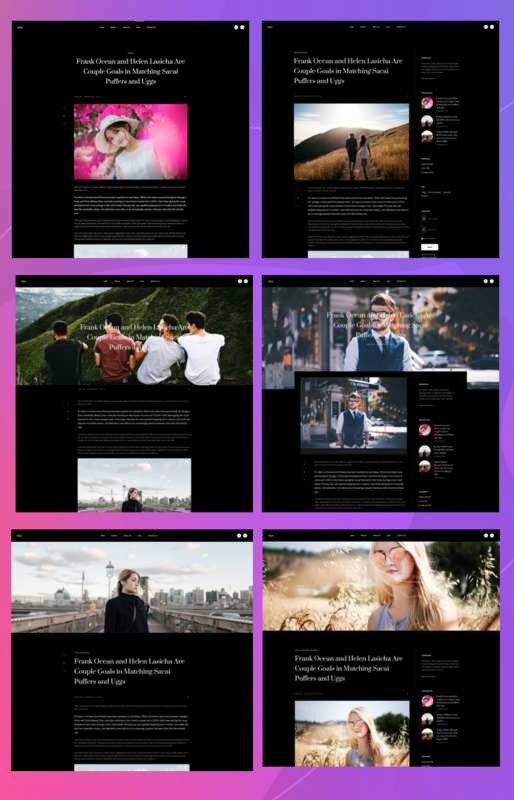 Yes you heared it right, the multipurpose Joomla template comes with 9 types of blog layouts that contains grid layouts, list layout, masonry and minimal views. This is something you are falling in love when you start adding the blog pages. 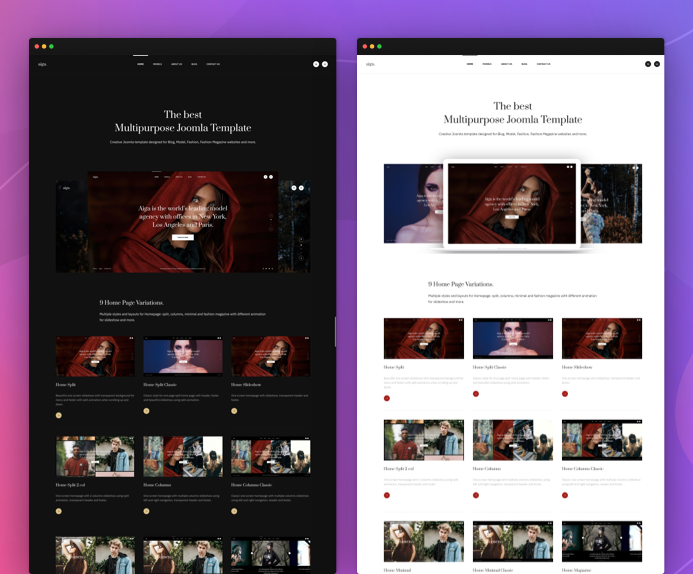 Multipurpose template has 6 types of layouts allows you choose a different layout for single article pages. An author/write always wants the content to be more user friendly, this template give a complete freedom to choose . JA Aiga template supports stunning layouts for all default Joomla pages like contact page, search page etc, to fit the design with multipurpose theme. JA Aiga comes with dark and light theme colors. Switching between theme is super easy (1 click) in the Theme setting panel. 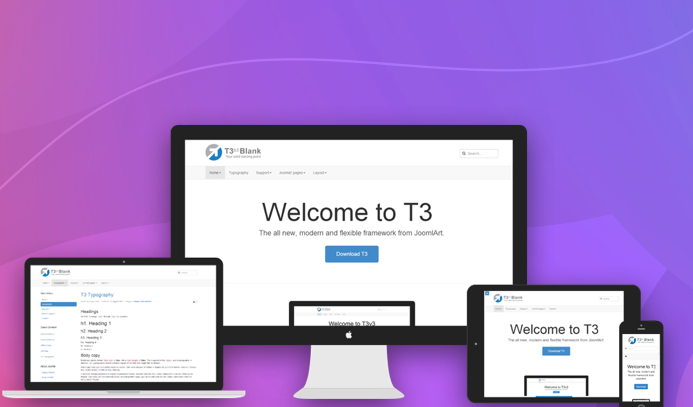 Thanks to T3 framework thats makes customization very easy and allow new theme creation in few clicks. JA Aiga template is based on the best responsive Joomla framework - T3 Framework with powerful features and ease of customization. JA Aiga supports the right to left languages that allows you to build a website in special languages: Arab, Persian, etc. JA Aiga comes with compliment extensions that gives and amazing look to site.